One of the least favorite parts of my day is when I have to take off my makeup. It's an absolute chore, in simple words. When will we get to the part of our technological advancement in society when makeup can take itself off? I definitely will be waiting for that day to come, but until then my skincare cabinet will continue to be a hoarding space of makeup removers, cleansing oils and balms, micellar waters, you name it. ExNatura Makeup Remover* was introduced to me through Vanda, who has her own beauty blog (that I'm a big fan of!) called Miss Viggity Beauty. This product really peaked my interest after learning that it's purely made with a water base and only plant ingredients. As you know, I've really gotten into green beauty this past 2016 and I've incorporated a lot of 'clean' products into my routine. I don't solely stick to one specific type, be it Korean, French, green beauty, and so on. I like to mix because I do favor certain ingredients, consistencies, etc, and I've found wonderful skincare gems from all around. I've mostly been using cleansing balms and oils to take off my makeup, which can provide some moisturizing benefits as well. But before this, I had yet to use such a unique and special makeup remover like ExNatura. 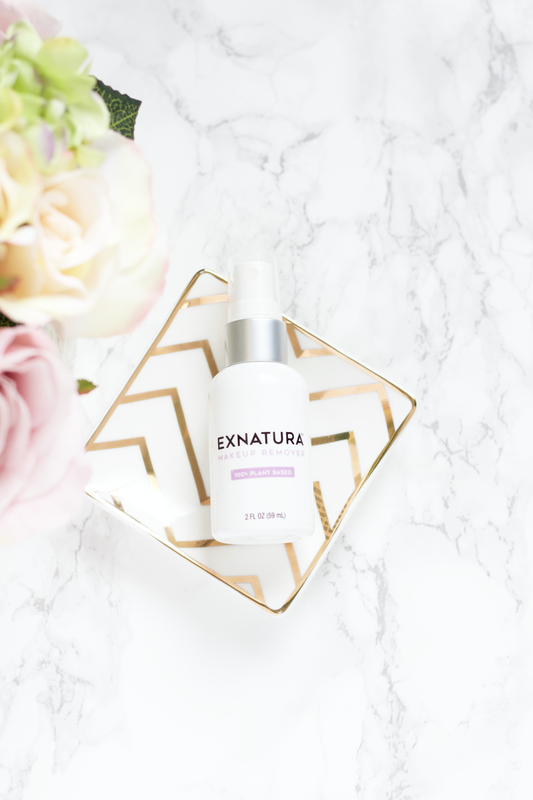 What exactly is ExNatura and what makes it so special from others? Let's start from the basics. 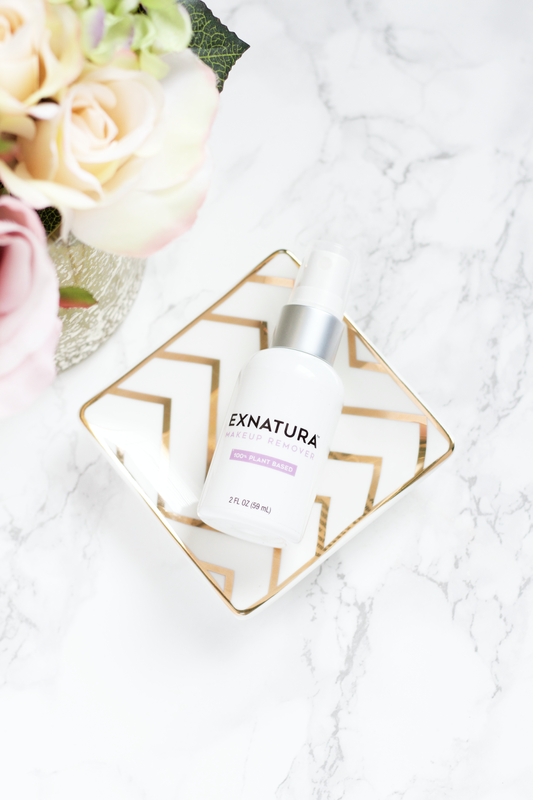 ExNatura Makeup Remover is formulated with plant extracts to create a blend that is gentle and effective for removing all kinds and types (waterproof, etc) of makeup on even the most sensitive skin. Its high quality is also seen in its ability to not leave any oily residue afterwards, only promoting fresh and clean skin. Since it's a green product, it has been carefully made to not include any parabens, toxins, carcinogens, or fragrances. They are 100% cruelty free and all of their ingredients are sourced in the USA. I also had the chance to ask the creator of ExNatura, Scott Babey, a few short questions and I want to share some of his responses here with you! 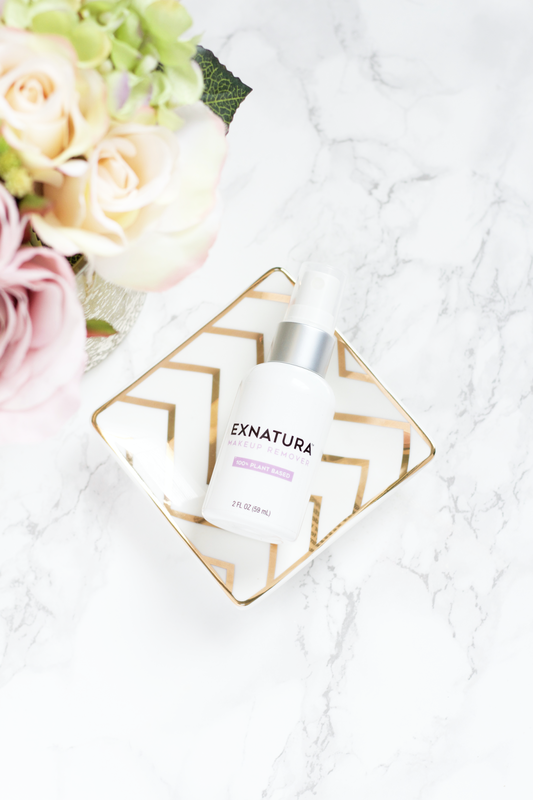 ExNatura is a very unique product and does indeed remove makeup so efficiently and visibly without much trouble. Using plant ingredients doesn't always spell excellent results, there also is another factor with how the product itself is made and formulated. Could you possible explain a little more about what makes this product so special with your extraction/blend process? S: "The process involved for formulation utilizes nano technology. When a product/substance uses this process, it penetrates at such a deep level that the substance just works better (nano particles will penetrate areas that normal physical substances or other products just cannot due to the law of quantum physics... you can fit 80,000 nanometers on the head of a pin/needle!). When you take this technology and couple it with natural ingredients (i.e. plants), then you have a 'win-win' situation. The majority of cosmetic products still utilize some, if not many, petroleum based ingredients. These products not only cannot work as well, but leave behind lots of harmful/toxic residue. Remember, our skin is like a sponge, and anything we put on it will be absorbed into our bodies and bloodstream. Another thing with these sorts of products is that no matter how well you 'think' you get your skin/face clean (whether washing with soap, using makeup remover, etc) there will always have a layer of petroleum left behind, no matter how minute. So, when you reapply makeup the next morning, you are just compounding more petroleum on top of petroleum." 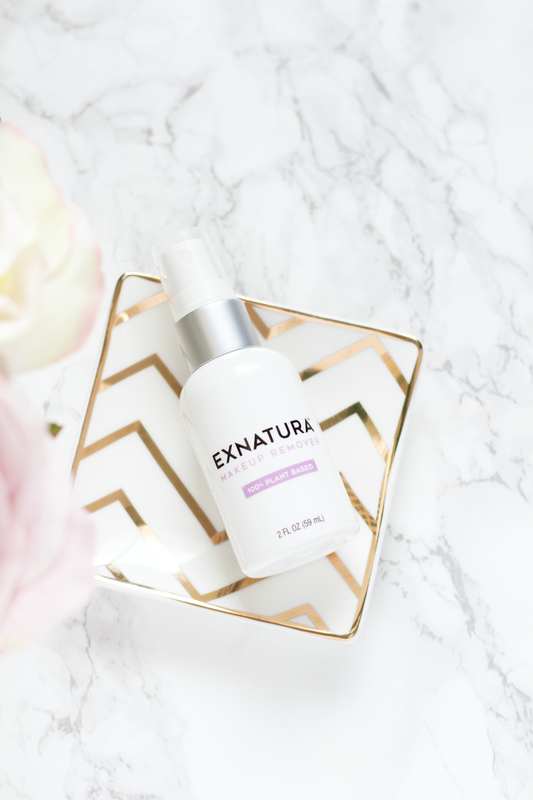 I really love the name ExNatura and how you took it from Latin. Was there a certain inspiration for choosing it? S: "The name 'ExNatura' came about out of necessity. The original name of the product was supposed to be 'Naturely Clean.' When I went to the trademark attorney and a search was done, he told me that there was a product with a very similar name and that there would be a lawsuit for sure. At that point, I decided to think outside the box. I had studied Italian for a few years, and also looked into a Spanish translation. I really wanted the 'nature' aspect to be prevalent in the name, and I love the way the Latin phrase translated." Do you currently ship international or have thought about shipping international? S: "I'm glad you asked about international shipping. I'm trying to work out some type of offer that will make it beneficial to cover shipping costs. I'm very interested in doing business in England with some retail locations. I can work a better pricing schedule shipping a dozen unites at a time." It's great to hear about the global shipping for all of you who are international! Scott also mentioned about some exciting releases he's been planning for this year and onwards, including a face wash, shaving cream, and makeup remover wipes! All of it sounds so exciting and I can't wait to see how ExNatura will flourish. A spray bottle of ExNatura holds 2 oz and retails online for $8.99, and one should last you about 30-45 days (per their FAQ). I've had mine for a few months now and I'm about more than half way done with it. You definitely can use it longer than 30 days without going through it but it really depends if you're only using this by itself, and also how many sprays you're needing. If you're sensitive to fragrances then you'll be glad to know that this practically doesn't have any scent to it. ExNatura states on their website that they want to keep their product as clean as possible. Since some people tend to have irritants with essential oils, they have opted to forgo that route as well. I mostly enjoy using this makeup remover to take off my BB cream, sunscreen, and any light makeup. I do think it does an excellent job as well to take off my heavier blusher, bronzer, and so on, but it really does well for lighter makeup! I have used it on my eye makeup, too, and it really breaks down the eyeshadow pigments and gets it off well. I sometimes need to go in a little extra more, especially if I've layered eyeshadow and used more sturdy liners, but it's not at all a problem. Mascara and waterproof mascara have always been a part of the makeup removing process that I have come to detest. It was very easy with spraying ExNatura on a cotton pad, holding it on my lash line, and applying pressure, to remove it all. 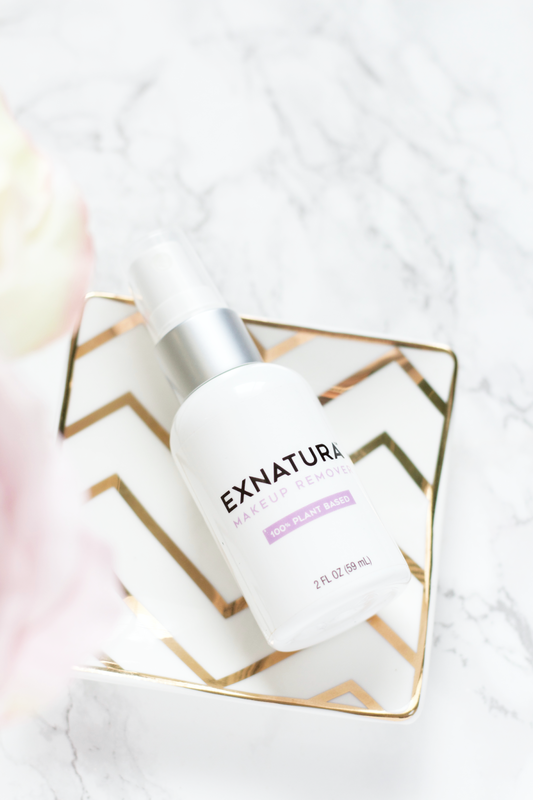 I think that's what makes ExNatura really so easy to use in my routine, it makes taking off makeup seem so easy and that's all I ever want. Ingredients: Non-Chlorinated Water, Processed Plant Extracts (Coconut, Corn, Grains, Sugarcane, Tree Sap). I want to provide some example to how this works and the efficiency of the product. I decided to test out the remover on liquid lipstick, waterproof gel liner, foundation, and a drier matte eyeshadow. ExNatura is not geared for taking off lip products, but I found it did a really good job at removing them! 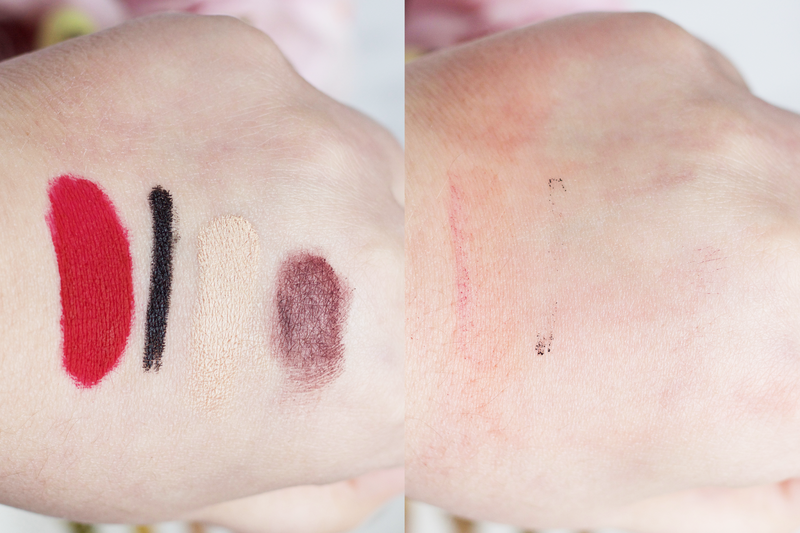 I went over this liquid lipstick about 2-3 times (after it's been dried!) and the right picture shows the aftermath. It got it off pretty well and I didn't even scrub at my skin, all I did was use a cotton pad and lightly push to take it off. The same goes for the waterproof gel liner (this dries pretty matte! ), this was after 2 times going over it. I was really impressed considering it's one of the blackest and toughest to get off once its fully set. I didn't fully wipe it off because I wanted to show you what it looked like after 2 times going over it. Scott had kindly given me advice that I can hold the cotton pad down for a few extra seconds when I'm taking off heavier makeup, just so that it picks up everything and works more efficiently. Whether you hold the cotton pad down or swipe over, I think either way it can work but holding it down might do well for concentrated areas. So you definitely can use this for heavier makeup, it just takes a few seconds more to get the makeup off. I'm really impressed with this ExNatura makeup remover. I'm really looking forward to the remover wipes that will be coming out. This is such a unique product and I'm really glad to have been given the opportunity to review it for you all! Do you have any favorite makeup removers? What's your holy grail product?